This article by Jerry Cates and Gaynor was first published on 17 May 2012 and revised last on 8 July 2012. © Bugsinthenews Vol. 13:05(06). Is this snake poisonous or not? I found one about a year ago about twice this size on my front porch, and now found this one in my back yard. I have small dogs, so I would like to identify the kind of snake it is. We live in a suburban neighborhood, but our lot backs up to a bayou and wooded area with a golf course. I would sure appreciate knowing if this snake is poisonous or not! The harmless broad-banded water snake is a beautiful snake, with broad bands of olive, black, dark brown, and reddish brown patches separated by yellowish interstices. Those colors practically scream “copperhead” to the uninitiated, and even give many, if not most experienced herpers a start for a second or two when they happen upon one in the wild. It seems likely that this similarity is another example of Batesian mimicry (Wickler, 1968) that benefits the water snake by causing it to be mistaken for a copperhead, and thus to be given a wider berth — sparing its life — than would otherwise be the case. Humans are not the snake’s natural predators, and its mimicry of a copperhead does not bode well for its survival in the presence of a human wielding a hoe. Studies show, however, that humanity affects the survivorship of natricine snakes such as this one way beyond our fondness for swinging hoes at the snakes we find in the wild. One analysis (Hopkins, 2005) of the effects of cholinesterase-inhibiting pesticides, washed into waterways after being applied to yards, showed that snakes exposed to such pesticides experience significant reductions in swimming velocity for up to 96 hours afterward. Though many cholinesterase inhibitors have been removed from the market in the past decade, some — notably among them the carbaryl Sevin, a mainstay in the arsenal of backyard gardeners — continue to be marketed. Even people who desire to spare the lives of non-venomous serpents have difficulty discriminating between this species and the copperhead, though, mostly because these snakes exhibit a considerable amount of variation from one specimen to another, not only in terms of coloration, but also in the placement and consistency of the bands of color involved. 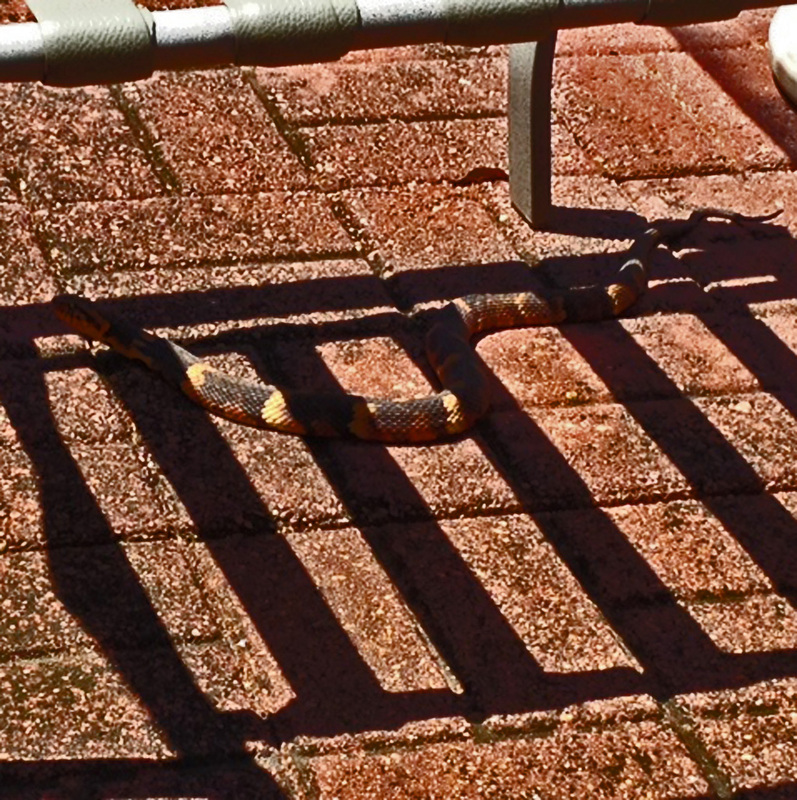 Gaynor’s specimen has unusually consistent banding, but the photo was taken with the snake under a chair, camouflaged by the dark shadows cast by the chair’s seat straps. I was pretty sure, just by looking at the original photograph Gaynor sent in, that this was a broad-banded water snake, but after manipulating the image with Photoshop all doubts ceased. The most conspicuous evidence for this being a harmless nerodian water snake was the brightly colored, darkly margined lip scales on the snake’s face. Almost all nerodians exhibit this character. The labial scales are larger than the adjoining facial scales, are basically bright yellow in color, and each labial scale is darkly outlined. Unfortunately the quality of this photograph is not sufficient to enable it to be cropped and enlarged to show just the face, but if you click on the photo it will expand to its largest practical size, and you will note it still shows the lip scales plainly, each one separated from the others by a dark thin line (two of which extend all the way to the eye). 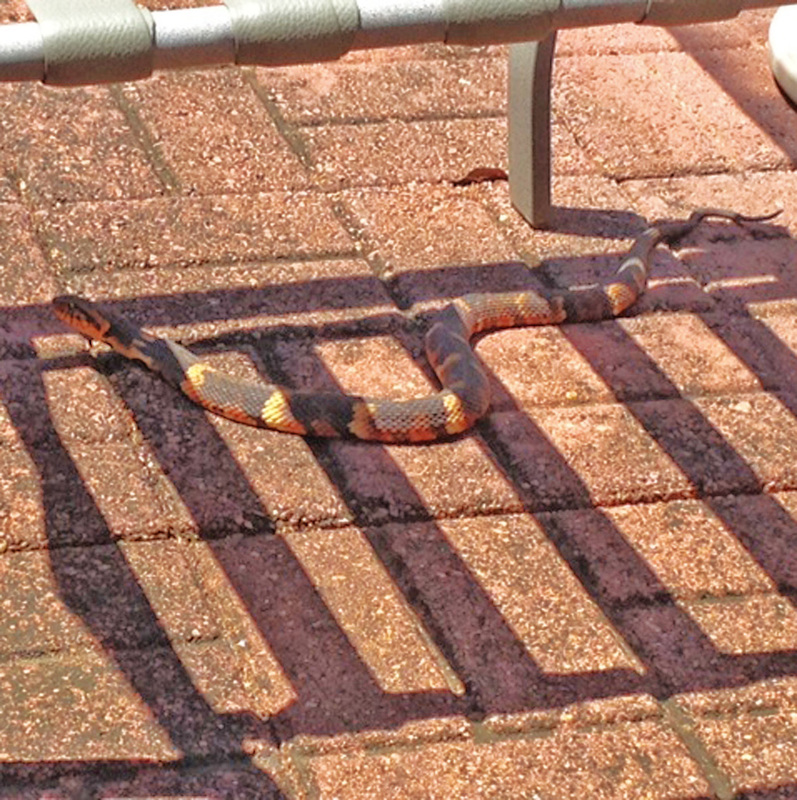 Compare this snake with photos of the broad-banded copperhead found in Round Rock in 2009 and you will see what I mean. Genus Nerodia (nay-RHO-dee-uh) — first described in 1853, jointly, by the American naturalist Spencer Fullerton Baird (1823–1887), and the French biologist Charles Frédéric Girard (1822–1895), who together crafted the generic name out of the Greek roots ναρος (NAY-rose) = flowing liquid + δια (DEE-uh) = through, as a reference to serpents that swim and search for prey in bodies of water. Crother, B. (Chair) et al. 2008. Scientific and Standard English Names of Amphibians and Reptiles of North America North of Mexico, with Comments Regarding Confidence in our Understanding. 6th Ed. American Society of Ichthyologists and Herpetologists. Hibbitts, T., and L. Fitzgerald. 2005. Morphological and ecological convergence in two natricine snakes. Biological Journal of the Linnean Society 85:363-371. Hopkins, W., et al. 2005. Differential swimming performance of two natricine snakes exposed to a cholinesterase-inhibiting pesticide. Environmental Pollution 133 (2005) 531-540. Lorenz, O., et al. 2011. Reproductive Physiology of the Broad Banded Watersnake, Nerodia fasciata confluens, in Southeastern Louisiana. Herpetological Conservation and Biology 6(3):410-421.